Diri is the Waray equivalent of the Tagalog word "hindi". It means "no" or "not". Below are some expressions containing the word "diri". Nine years ago I was once like the deaf old man in Ernest Hemingway's "A Clean, Well-Lighted Place." I was married -- I still am -- but my husband was away. I was childless then. I had this feeling that going home to an empty house was always an ordeal. In this short story by Hemingway, the old man frequents the café and stays there until the wee hours of the morning. His presence every night leads to an engaging banter between the two main characters, the older waiter and the younger waiter. It seems like when people are in a situation where they feel alone because their families are not there, they seek the company of friends. If no one can give it to them because their friends are busy with their own lives, finding a place of temporary solace (the café for the old man; the campus beach for me) is a rewarding experience because it is there where one can organize his/her thoughts and in the process ponder about life. The contrasts between the two main characters of "A Clean, Well-Lighted Place," depict two types of people -- the compassionate and the unsympathetic. The younger waiter, is always in a hurry to go home to his wife after work. At some point, he becomes rude to the old man and refuses the latter's request for another brandy. Apparently, his priorities are different because he is young. The older waiter, on the other hand, is understanding and sympathetic to the customer and to people in general. This is probably because he is alone in life and has reached that phase where he is already settled and does not have to compete with anyone in order to achieve a goal. No loved one is waiting for him at home. He has nothing except his job. "Nada," according to him. Only when people have gone through something do they become sympathetic with other people's needs. Hence, the older waiter's statement: "Each night I am reluctant to close up because there may be someone who needs the café." He works diligently to make the place clean and pleasant so that it will provide comfort to whoever will need it. Oh how painful it is to go home to an empty house! Our homes remind us about the persons we miss. We can see the same furnishings and the same arrangement of things around the house but the person we love is no longer there. What stands out is the person's absence. Probably this is one reason why some people want to be away from their homes and to stay in some clean, well-lighted place at night. They are surely not looking for some fun where they will lose their dignity as a person. Instead, they are there to temporarily forget some pain and to tire themselves out so that sleep will not be elusive as they lie on their wide beds. Common Expressions Using the Word "Waray"
The word Waray does not only refer to the Waray-speaking people or to the Waray language, but it also refers to one particular Waray word, "waray", which means "nothing", "none", or "not". Here's a list of common expressions using the word "Waray". Common examples of Waray adjectives are mahusay (beautiful), mabara (ugly), mataba (plump), mahugos (thin/skinny), maduas (pale), mabusag (having the quality of being white), mabaga (having the condition of being red), mapili (having the condition of being black), bulaw (brown), maupay (good), marasa (delicious), mabaho (stinky/smelly), and mahumot (fragrant). Aside from their songs that are naughty and nonsense, the Warays have also their own share of songs that speak about life and about love. 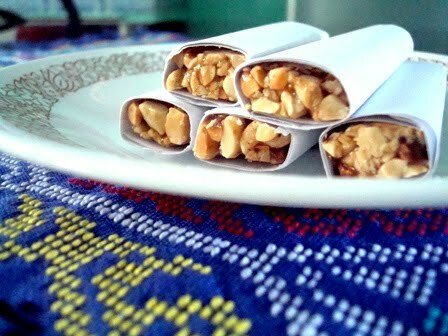 They have a profound effect on my being as a Waray, for they bring poignant memories of my hometown and of my childhood. In the 1980's while my high school contemporaries were singing Madonna's Material Girl and Papa Don't Preach, I was busy learning Waray songs from Mana Saning and from Mana Jenny, leaders of San Roque Parish Church Choir. Nanay Remy, my mother, likewise taught me songs from her native town of Borongan, Eastern Samar. Aside from these three women, I also learned some songs from the older women of Kalye San Francisco in San Roque, Northern Samar. I sat with them while they drank tuba (coconut wine) and sang Waray songs. My repertoire of songs grew as I met friends from Laoang and from Catubig. We sang a lot and we always made it a point to sing songs in Waray. 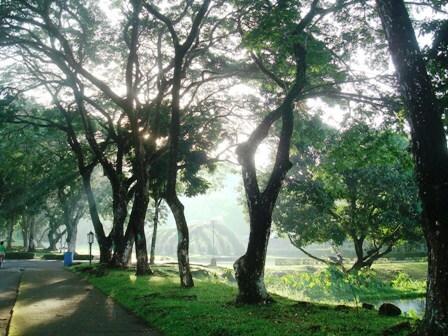 Probably we were thinking that it was our only way of connecting with our roots -- we had to leave our families and our hometowns to pursue college education in the city. In school, I was a member of a performing arts group. We did community immersions and we gathered and performed songs indigenous to the islands of Samar and Leyte. Before I become totally engulfed by forgetfulness, let me share the lyrics of these songs so that my fellow Warays can make use of them or can sing them. Like the women of San Roque and the other Waray speakers who unselfishly shared these songs to me, I am likewise sharing them to you now. Only virtually, though. To my fellow Warays searching for or googling -- yes, google is also a verb, :-) -- "lyrics of Waray songs", this post is for you. Except for Balud, the songs below cannot be found on the World Wide Web as of this writing. To those who don't speak Waray, I have not prepared any English translation for these texts. Since I'm a blogger and not a poet, I'll leave the job to them: the Waray poets. Nailiw na an baras ngan bato. Nailiw na an kasing-kasing ko. 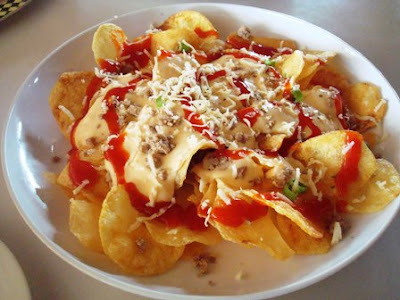 Kon sa kasing-kasing magpabilin kita nga buta. An lamrag murayaw, may kahimayaan. 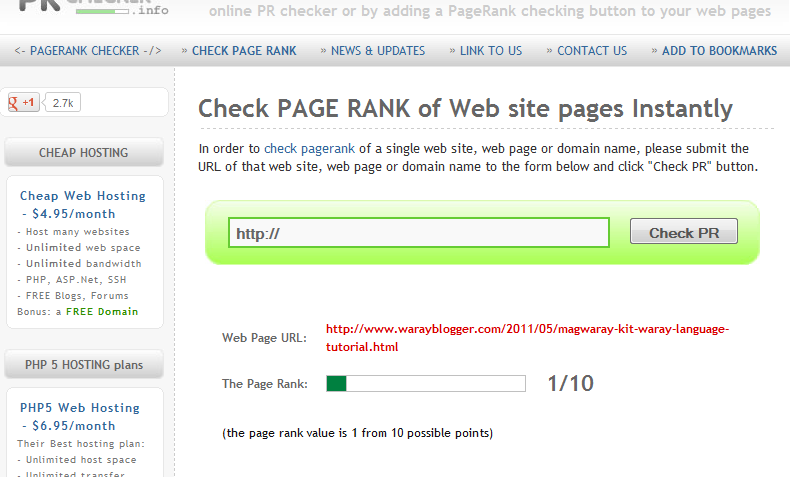 There has been a Google PageRank update very recently. It started several hours ago according to some webmasters. I'm happy with the outcome of this update. 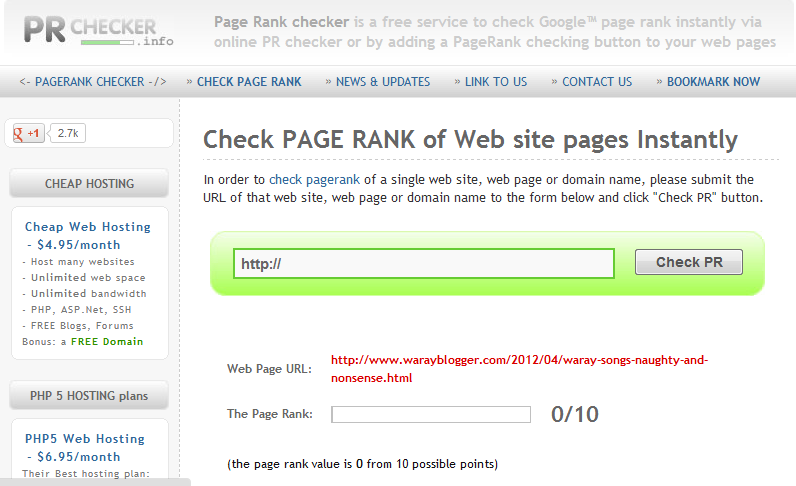 I temporarily lost my PageRank (PR) when I registered Warayblogger as a domain name in January this year. Now I'm back to having that green thing in the PR toolbar again. 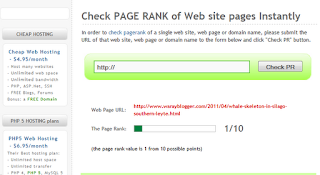 Did you know that the individual posts of a site are ranked individually? 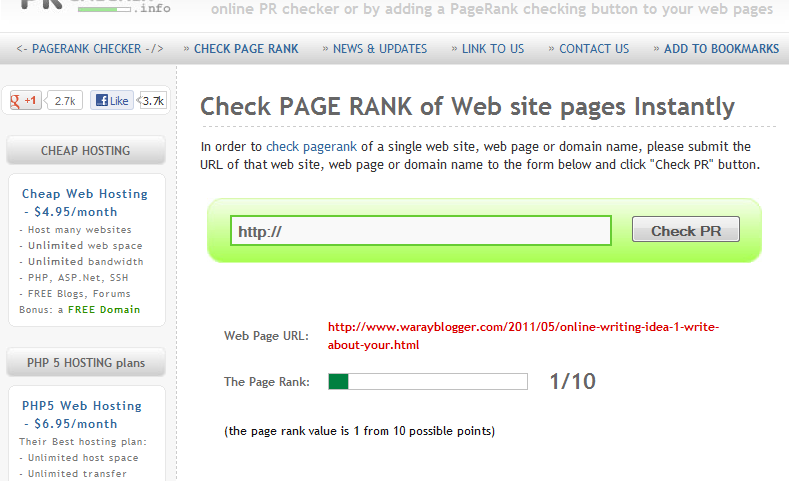 I checked my blog posts and saw a gray PR in some of my pages and a green PR in the other posts. My latest write-up, Waray Songs - The Naughty and the Nonsense is gray (0/10) while some others are green (1/10). Whale Skeleton in Silago, Southern Leyte -- the First on Leyte Island is likewise green. 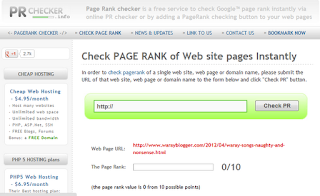 Do you want to see your Google PageRank? 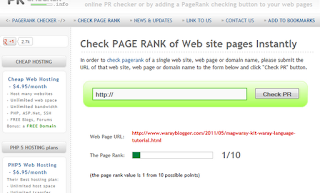 For quick results, use Check Your Page Rank's domain evaluation tool. There's no need to type an "anti-bot" code because the site does not require one -- that's what I like about this tool. Once you give your site's URL, you will see the number of Yahoo, Google, and Bing.com links for your site. It also determines the domain age of the site. 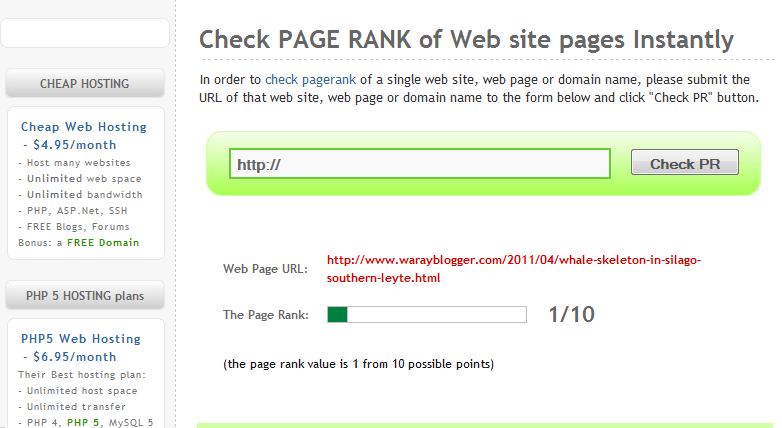 However, you must ignore the Alexa Rank given by this tool because it's not accurate (as of this writing at least). 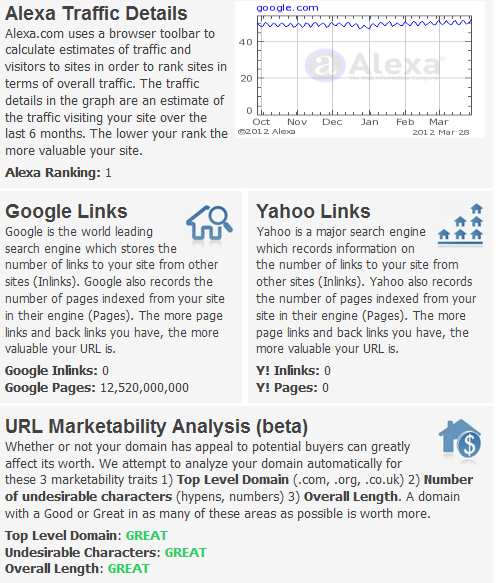 Download the Alexa Toolbar to your computer or go directly to www.alexa.com if you want to get the current Alexa Traffic Rank of your site. 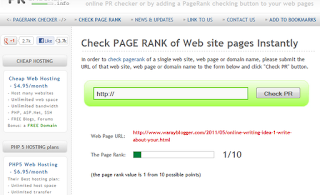 To check the Google PR of individual pages or posts, I recommend PRChecker.info. You may not feel very convenient with this tool -- you will have to hit two buttons plus type an "anti-bot" code before getting any information from the site -- but it's worth it. Did you notice that long URL in the photo above? That's the URL of one of my blog posts. Try this in the former tool and you will have an N/A result. It only accepts the URL of your homepage. 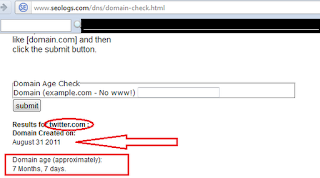 So far, I haven't come across any site that performs what PRChecker.info does. If your site is not ranked yet, remember what other webmasters and bloggers have been saying: the Google PR may be important, but it's not the "be-all and end-all" of online writing. Let's do what makes us happy. Let's keep writing and keep the fire burning. There's another PR update coming, anyway. "The Waray people were musically-inclined. They sang every day and stopped singing only when they were sick or when they were asleep." I read this in William Henry Scott's book titled Barangay: 16th Century Philippines. Apparently, the modern-day Warays are very similar to their ancestors in that respect. Musically inclined, that is. Proof of this is the popular and the folk songs composed by the Waray people, many of which were sung and recorded by artists like Balinsasayaw Singers, Ms. Cielo Tibe, and Mabuhay Singers. Si Mr. Tanduay nga adto sa tindahan. Dakpa iton kay im sangod. These songs are either senseless or replete with double meanings and are usually sung in informal gatherings or drinking sprees. The good thing is that you forget to dwell on the nonsensical and sometimes vulgar text and learn to enjoy the songs because of their melodies. How Old is Your Favorite Website? 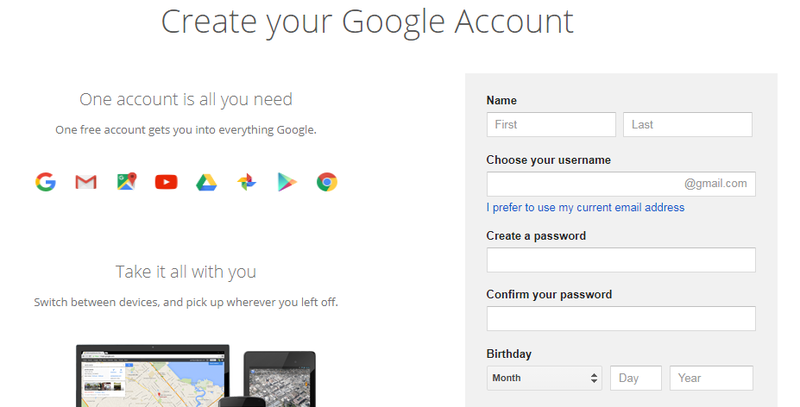 How old is Google? What about Yahoo? Which is older, Facebook or Friendster? Is there a way to know the age of your favorite website? There are two sites that give ready answers to these questions. SEOlogs.com (www.seologs.com) determines the approximate domain age of a site once a URL is submitted to its Domain Age Check Tool. Here's what I gathered: Google's domain was created on September 15, 1997; Yahoo, on January 18, 1995. As of March 31, 2012, Google's approximate age is 14 years and 6 months old. Yahoo's approximate age, on the other hand, is 17 years, 2 months and 11 days old. According to the same tool, Facebook is older than Friendster by 5 years (see information below). Notice that SEOlogs uses the word 'approximately'. It's because most websites don't immediately buy their own domain names during inception phase. Some webmasters use free webhosting sites before fully launching their own sites to the public. Hence, there's a big chance that most of these sites are older than their actual domain age. Below are some popular sites and the dates their domain names were registered. 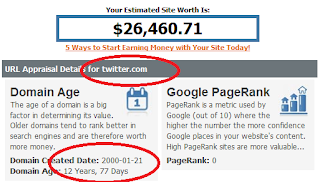 There's another site that determines the domain age of a website. It's called URL APPRAISAL (www.urlappraisal.net). 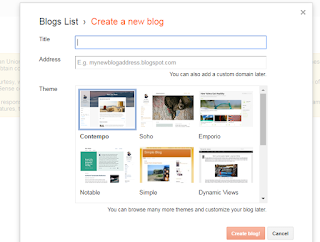 If you own a blog, you might find this tool very useful. 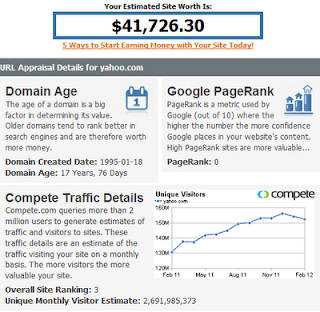 Not only does it tell you about domain age, but it also gives an estimate of a site's value. As of March 31, 2012, Yahoo's estimated site worth is $41,726.30; Google's, $34,293.54. If there's any information that's not accurately given by URL Appraisal, it's the Google PageRank (all websites are ranked 0/10, according to this tool). 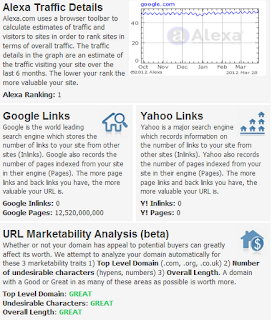 Other information provided by the website are: Compete Traffic Details, Alexa Traffic Details, Google and Yahoo Links, and the URL Marketability Analysis. 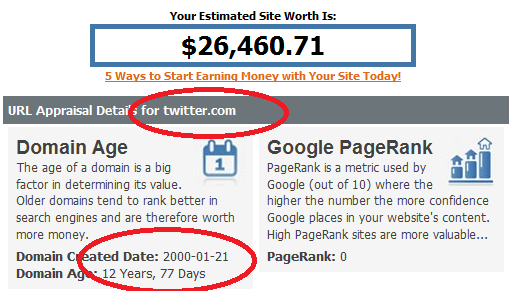 The two sites give different dates for Twitter's domain age. I'm placing here the screenshots of the results given by the two sites. May uso yana sa bug-os nga Pilipinas: an pick-up lines. Bisan diin ak lingi, nabati ak sini -- sa TV, sa eskuylahan, sa balay. Mga arug ngan bata, may sira mga pick-up lines. Kon may Tagalog ug Sugbuanon nga istorya para sa mga naghihigugmaay, siyempre diri puyde nga waray an Waray. Ini nga koleksiyon sin pick-up lines, produkto san ako pakig-iristorya sin duha ka "bagets" didi sa balay. Diri pa ini tangpos, yaon pa sumpay. Inday: Dodoy, konta alarm clock ka na la. Inday: Kay para makagmata an nakaturog ko nga kasing-kasing. Dodoy: Inday, pareho ka sin blog. Dodoy: Kay karuyag ko ikaw ig-follow. Dodoy: Inday, kape ka ba? Dodoy: Kay diri kumpleto an pamahaw kon waray ka. Dodoy: Inday, konta "light" ka nala. Dodoy: Kay para diri na masirum ako kinabuhi. Inday: Kay diri ak puyde gumawas sa balay nga waray ka. Inday: Kay diri ka sa ak nabulag. Inday: Kay naglulubad-lubad im kolor basta nakita ka sa ak. Inday: Maaram ka, Dodoy, pareho ka sin regla. Inday: Kay tag-sayo (tag-usa) ka la bumisita kada bulan. Dodoy: Konta takgung ko ikaw, Inday. Dodoy: Kay para diri ka sa ak mahibulag. Dodoy: Inday, konta tanom ka na la. Inday: Mao ba, Dodoy? Kay nano? Dodoy: Kay para maataman ko ikaw. 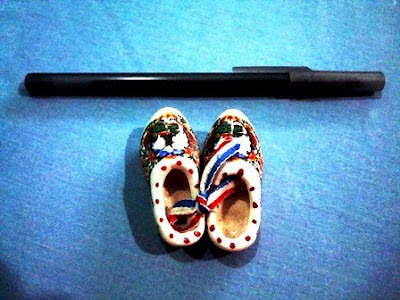 Dodoy: Ako an bolpen, ikaw an tinta. Inday: Kay nano nga nahimo man ak nga tinta? Dodoy: Kay padayon ak nga naalop kon yana ka. Dodoy: Inday ko, konta wallet ka na la. Dodoy: Darako konta ako natipid. Inday: Konta yabe ka nala. Inday: Kay para maabre na an ako kasing-kasing nga nakatrangka. 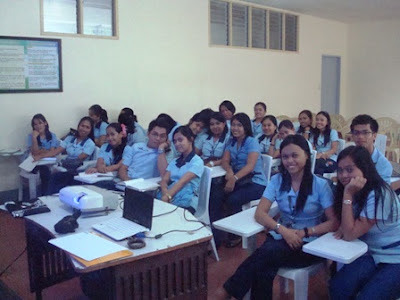 While there is no such thing as plural adjectives in the English language -- attractives, cutes, beautifuls, uglies -- it is common for Waray language speakers to express Waray adjectives in plural form. In the same manner, add the letter "G" to the following adjectives and you'll have them in plural form. There may be some exceptions to this rule, but if you're new to the language this lesson will bring you a long way. Hope this helps. The second way of doing it is by adding a prefix and a suffix to the root word. Normally, the prefix KA and the suffix AN are added to the word; hence, bata becomes kabataan and kahoy becomes kakahoyan. Harok (kiss), however, cannot be expressed in plural form using this style. You either say harok or mga harok, but NOT kaharokan. There is a slight variation with how the words lalaki, babaye, and daraga are expressed in plural form in Waray. Instead of the suffix AN, the letter N is added to the root word before adding AN: kalalakin-an, kababayen-an, kadaragan-an. With ulitawo, the letter "O" is replaced with letter "H" before adding the suffix AN: kaulitawhan. Moreover, "D" in patud is dropped and is replaced with the letter "R" before the suffix AN is added. "O" is likewise dropped in urupod when expressed in plural form. 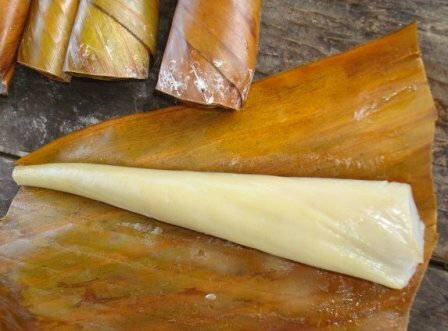 The way mananap, changes to its plural form is even more complicated. "M" is inserted between the two final letters (A and P); hence, mananap becomes kamamanampan. One piece of advice: if you think the second style is complicated, you just stick to the simpler one: add "mga" to any Waray noun (place it before the word) and you will have it in plural form. Sooner or later, you will consider the idea of buying your own domain name. If you are obsessed (this is too strong a word, I know, but I always like to exaggerate things) with your Google and Alexa rankings, I suggest that you do it early. 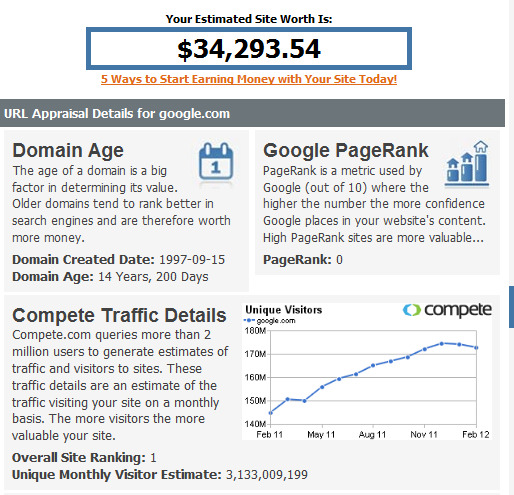 Buy your own domain name while you still haven't reached a Google Page Rank of 3/10. Why? 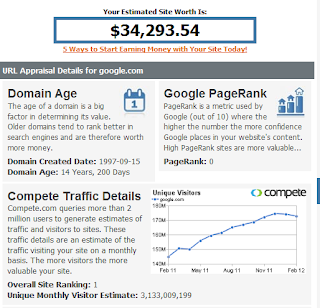 Domain age is one area that's considered when evaluating a site. The older your site is, the higher its importance in the World Wide Web -- or so I "heard" from other bloggers. The moment you register your own domain name, your site's age returns to 0 (zero) and you lose everything like Facebook Likes, Google PR, Alexa Traffic Rank, and backlinks; hence, it's good to do it early and to do it right. Before you make that very important decision, look around and compare the prices available on the web. Do a Google or a Yahoo search and you will see that prices of domain names range from $1.99/year to $10/year. I'm not promoting any particular webhost here, but I just want to tell you that there are sites that sell domain names at $1.99. I didn't know this at the time I registered mine. Good luck! Here's a Waray song I learned from my father. 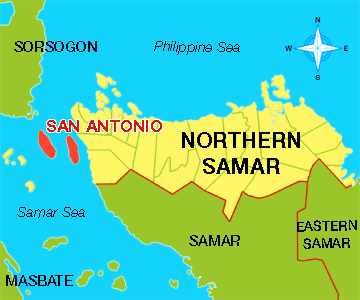 In the early 1970's he was assigned in San Antonio, Northern Samar as a PACD (Presidential Assistant on Community Development) officer and it was there that he learned the song. I became familiar with the Mocking Bird Hill (by Patti Page) tune because of Misay nga Mambanon (Spotted Cat). I'm posting here the lyrics of the song. You may play the youtube video -- audio actually, because except for that static photo there's nothing else to see -- while singing Misay nga Mambanon. To the "Warays" out there, I hope you'll include this in your list of favorite Waray songs. Waray na la translation nga ak gin-api kay di kaya. 1. On your Dashboard, click SETTINGS. 2. 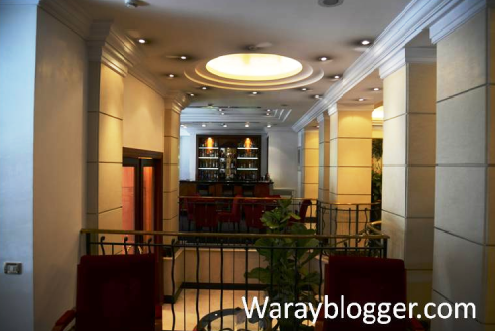 On the TITLE, write the new name or title of your blog. So, you finally decided to have your own blog, but you don't know how to go about it. 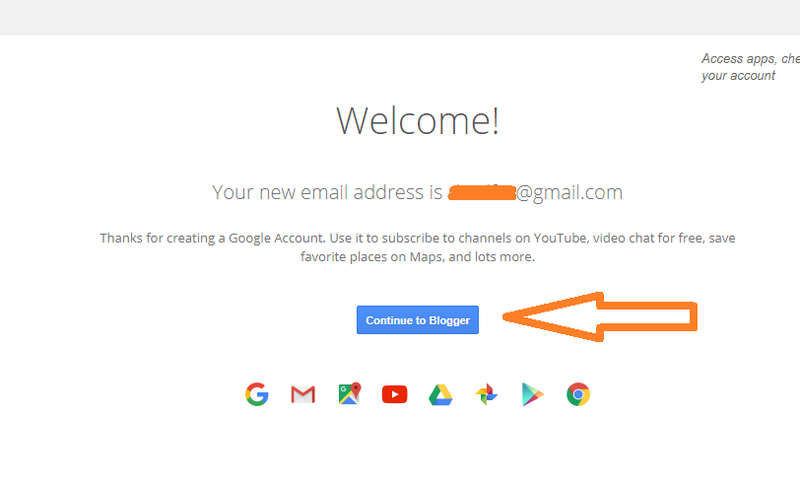 In this post, I'll do a step-by-step guide on how to set-up a blog at Blogger.com. You may 'right-click' the pictures to better understand this tutorial. 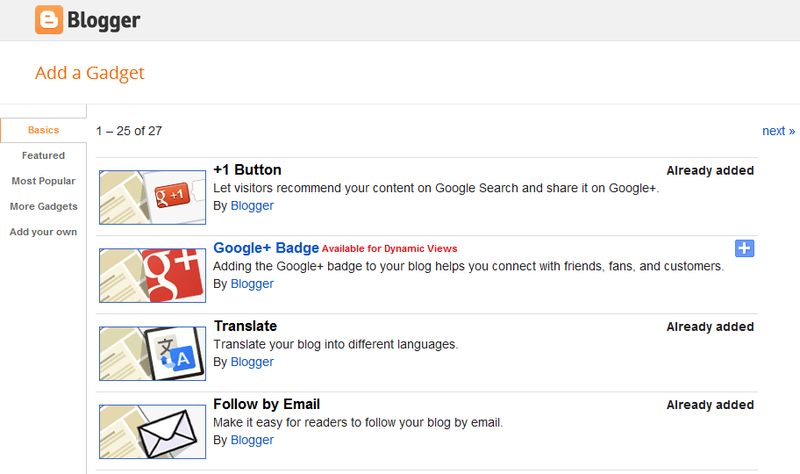 Type www.blogger.com in the address bar of your web browser, and click "CREATE YOUR BLOG." 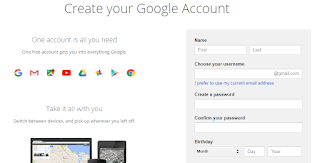 Create your Google account by filling out this form. After accomplishing the form, click "Next Step." 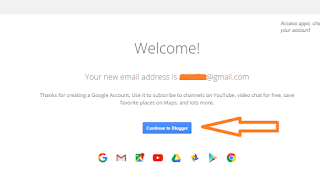 Don't forget to read the Blogger's Privacy and Terms [formerly this was Terms of Service (ToS)] before clicking "I agree." 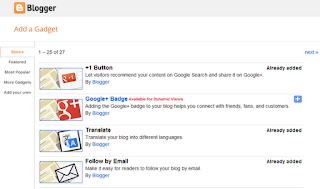 (I have heard about bloggers who were suspended from using Google Adsense because they violated some items in the ToS. Blogger operates in this manner -- you violate its stipulations and your account gets suspended.) Click "Continue to Blogger." 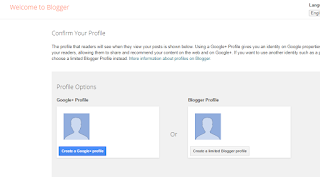 You will be asked to confirm your Google+ profile. 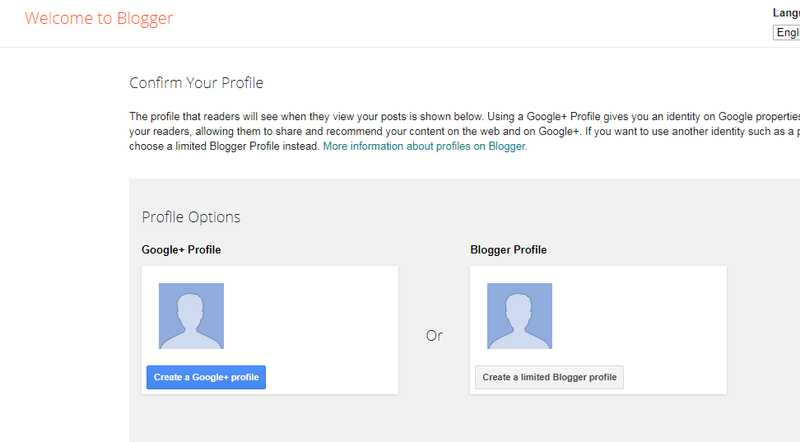 For this demo blog, I'm choosing the limited Blogger profile option. 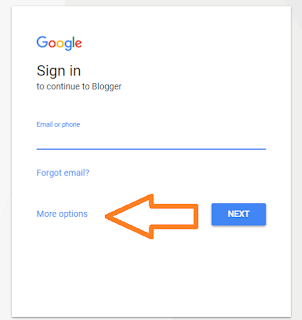 Click "Continue to Blogger," and click "Create new blog." Write your desired title and address. The title is the name of your blog, e.g., Student Interns. The address is its Uniform Resource Locator or URL, e.g., http://studentinterns.blogspot.com. 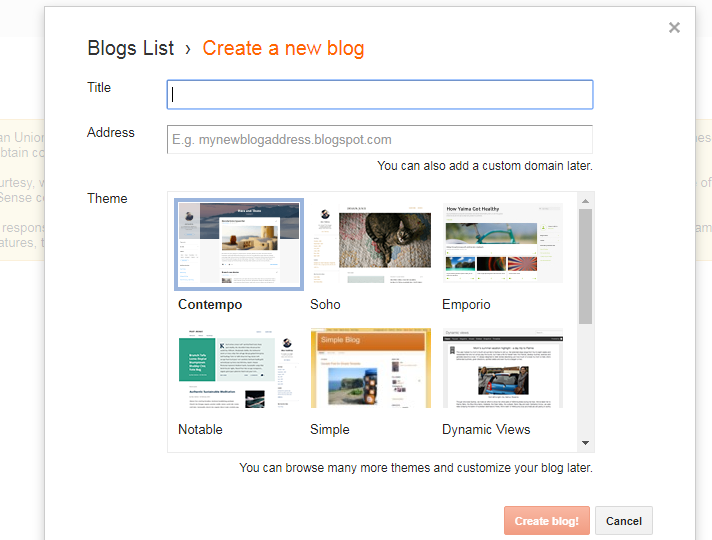 Choose the theme of your blog, and click "Create Blog!" Now, you're ready to write your first blog post. Write the title of your first blog post in the title bar. Click "PUBLISH" after you have written everything you want to say in this maiden post.